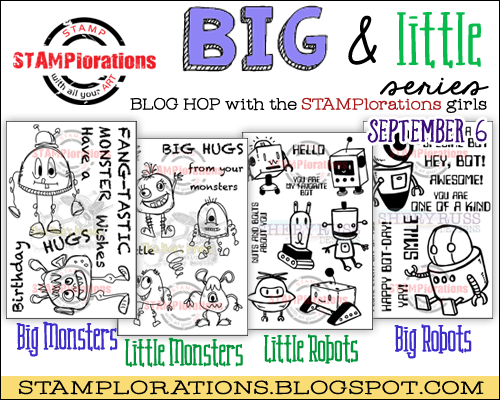 We've got another mini-release for you at STAMPlorations, the Big and Little Series. Shery's designed Big Robots and Little Robots, and I've designed these monster sets - Big Monsters and Little Monsters, and I love them to bits! I've had so much fun colouring these guys. I ended up with a pile of of them. 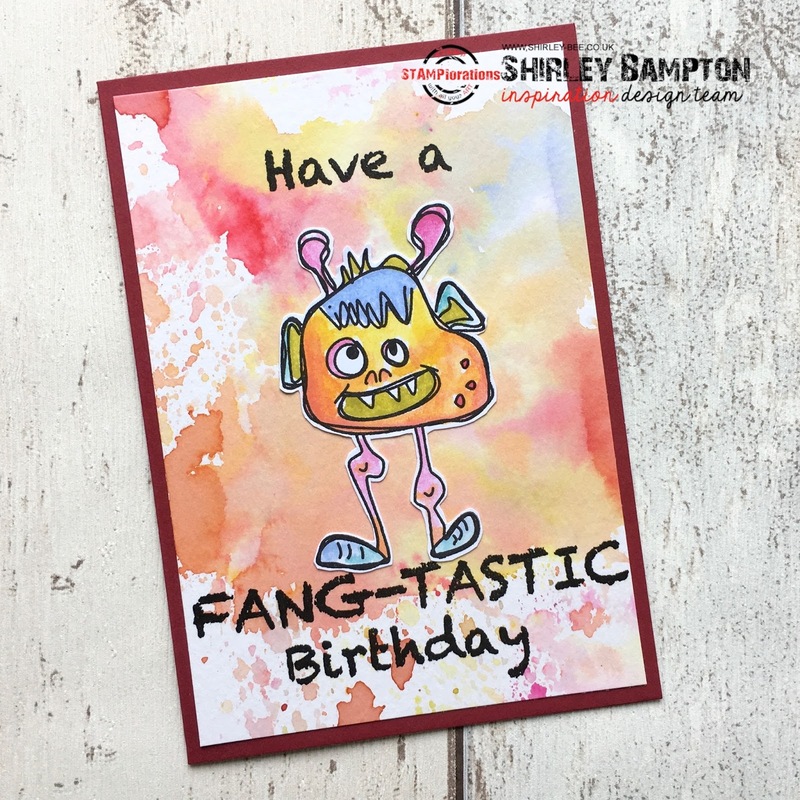 For my first card, I mopped up all of the Distress Ink left on my acrylic block after watercolouring all my stamped monsters, which gave me this background. 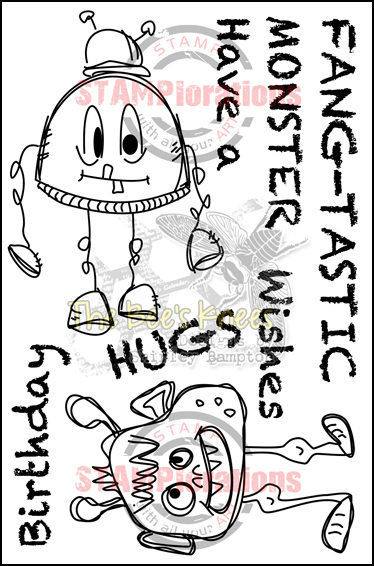 Then it was just a matter of choosing which monster looked best against the background, and stamping the sentiment. 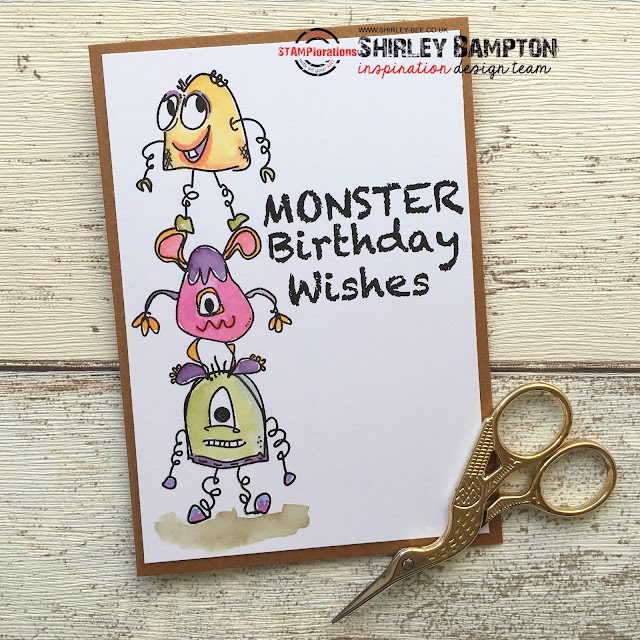 All the stamps on this card come from Big Monsters. 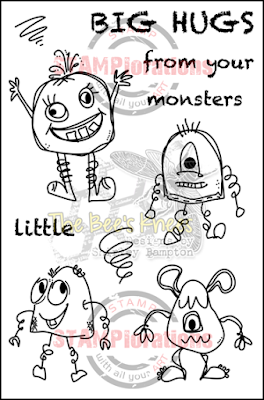 Aren't these Little Monsters so cute?? I can't decide which one is my favourite :) I love the coils and boings, really gives them movement. All of the stamps on this second card are from Little Monsters. For this next card, I die-cut a Crazy Double Running Stitch Rectangle, then cut another rectangle out using the Bloom Happy die set, and added my Big Monster leaning out of the frame. 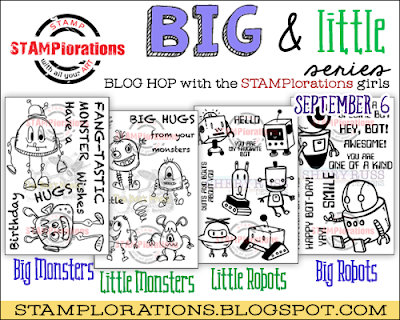 All the stamps are from Big Monsters. Of course, you can mix and match from the two sets. The sentiment on this last card is from Big Monsters, and the images are from Little Monsters. The base card is quite thick and wouldn't lie flat for photography - that's where the scissors come in. 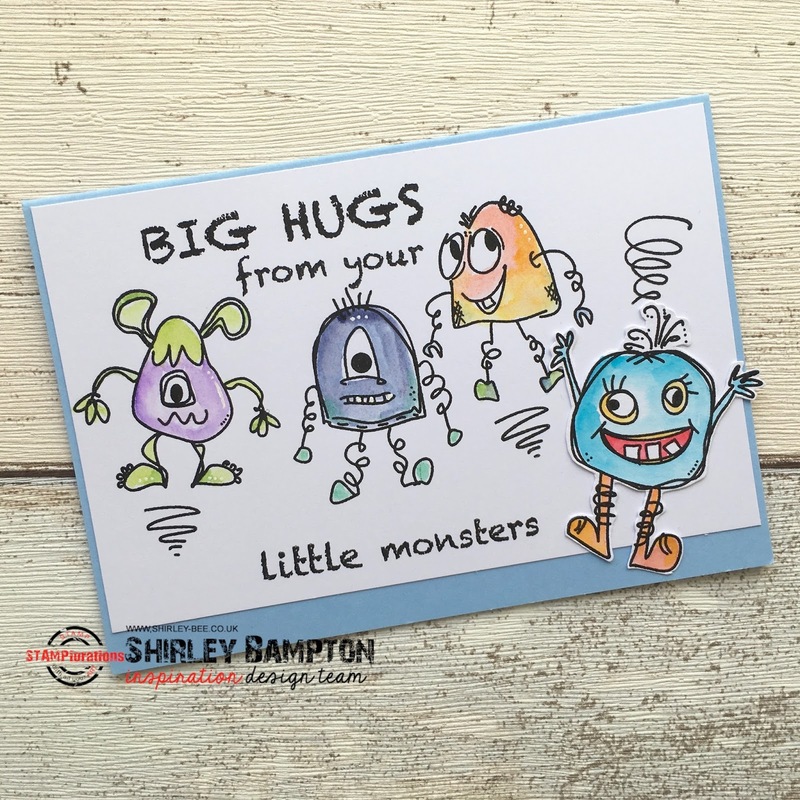 Pop on over to the STAMPlorations blog for some more fabulous inspiration from some of our design team using my Monsters and Shery's Robots, and comment on all our posts for your chance to the set of your choice from this release. The stamps are already in the store, with 5% off for the first week of their release. And if you use my code STAMPGIRLSHIRLEY you'll get an additional 20% off. Happy shopping! So cute :) those lil monsters are adorable and funny ! These sets are so cute. My grandchildren would love these. that about monsters. Fantastic cards. Aww!!! How cute and funny!!! Super cute monsters, both big and little! Love the sentiments too! 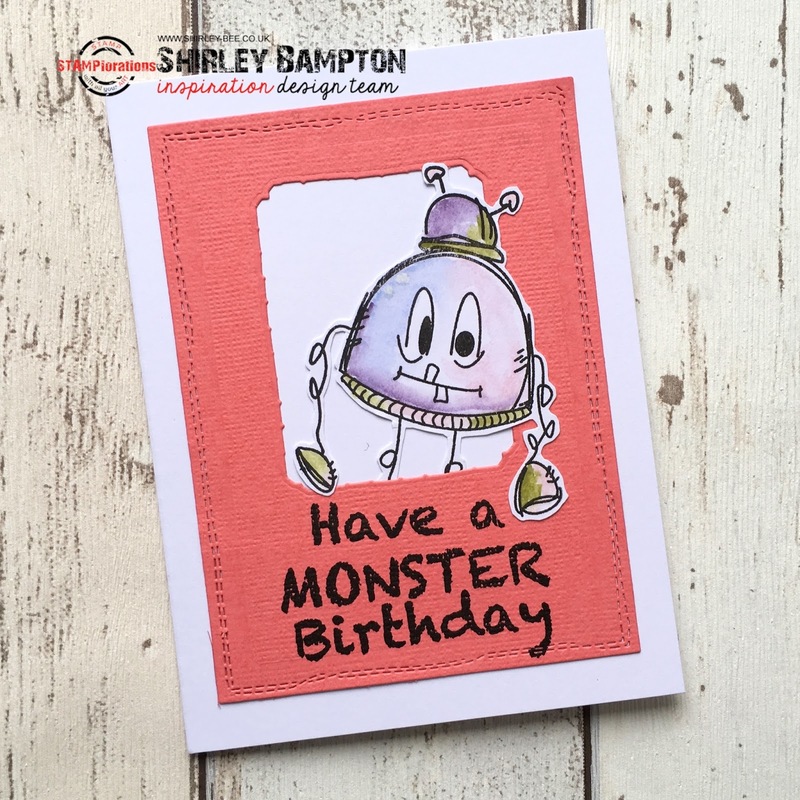 Your cards are great, loving the layers, distressing and colors! Wow...so much fun. Love all your sweet little critters. Great cards, your background is fabulous.